Plus All-New Never Before-Seen Extras! BURBANK, CA (April 25, 2014) - Warner Bros. Home Entertainment (WBHE) brings the compelling police procedural Major Crimes: The Complete Second Season to DVD June 10, 2014. The show that started as a continuation of the critically acclaimed series The Closer, has become a successful hit in its own right, ranking as TNT's #2 series during its sophomore run on the cable network. * Consumers can own all 19 episodes of this powerful series' second season on DVD, plus loads of bonus material, including never-before-seen featurettes and deleted scenes. Titled Major Crimes: The Complete Second Season , the release will be timed to the show's third season premiere on TNT this summer. The four-disc DVD set will retail for $59.98 SRP. 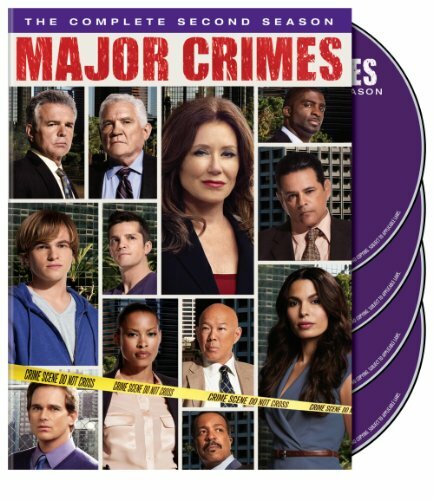 Major Crimes is back on the case for a thrilling second season as two-time Oscar(R) nominee Mary McDonnell (Dances With Wolves, Battlestar Galactica) continues as Captain Sharon Raydor, the head of the LAPD's Major Crimes division, joined by an unforgettable ensemble cast featuring G.W. Bailey (The Closer, M*A*S*H, Police Academy) as Lieutenant Provenza, Tony Denison (The Closer, Crime Storyk) as Lieutenant Andy Flynn, Michael Paul Chan (The Closer, Arrested Development) as Lieutenant Mike Tao, Raymond Cruz (The Closer, Training Day) as Detective Julio Sanchez, Phillip P. Keene (The Closer, The D.A.) as Buzz Watson, Kearran Giovanni (One Life to Live) as Detective Amy Sykes, Graham Patrick Martin (The Closer, Two and a Half Men) as Rusty Beck, Jonathan Del Arco (The Closer, Nip/Tuck, Star Trek: The Next Generation) as Dr. Morales, and Robert Gossett (The Closer, Arlington Road) as Assistant Chief Russell Taylor. Nadine Velazquez (Flight, My Name Is Earl) joins the cast this season as Deputy D.A. Emma Rios, and Jon Tenney (The Closer, King & Maxwell) appears as Special FBI Agent Fritz Howard. Major Crimes: The Complete Second Season dives into some of the most challenging and fascinating crimes yet, including the murder of a big-time director's wife, an apparent murder-suicide and a high-speed car chase that leads to a triple homicide. Just as the squad seems to be adjusting to last year's leadership change, D.D.A. Rios arrives to challenge the division and their material witness in the ongoing case against serial killer Philip Stroh. Torn between what is right morally and what the law commands, Raydor and her team are faced with more personal and professional struggles than ever before as they continue to make deals and crack cases. "Major Crimes has fully evolved into its own distinctive series. Fans of The Closer, its predecessor, have fallen in love with Mary McDonnell and the rest of the cast, who have done a remarkable job in taking the series to the next level. It's an intelligent, compelling drama that successfully filled a potential void that could have resulted with The Closer's end," said Rosemary Markson, WBHE Senior Vice President, TV and Special Interest Marketing. She added, "We are pleased to bring viewers 19 episodes from the show's second season in addition to exciting bonus material no Major Crimes fan will want to miss." Major Crimes is produced by The Shephard/Robin Company and Walking Entropy, Inc. in association with Warner Bros. Television. The Closer's James Duff, Greer Shephard, Michael M. Robin, Rick Wallace and Adam Belanoff serve as executive producers. *	Major Crimes: Personal Conviction (Featurette) - Major Crimes has some major life events in store for the squad in the second season and we'll examine how each character grapples with questions of the soul..
For more information on this and other titles distributed by Warner Bros. Home Entertainment, visit www.whvdirect.com.